As we continue working hard to make our Stonepunk arena action game Antegods a reality, you can stay up to date on our development process with regular blog posts from our design, art and code team. This time, Game Designer Wytze will share some of the cool design changes we have planned for the behemoths at the center of every game of Antegods. As we continue working hard to make our Stonepunk arena action game Antegods a reality, you can stay up to date on our development process with regular blog posts from our design, art and code team. This time, Game Designer Wytze will share some of the cool design changes we have planned for the behemoths at the center of every game of Antegods. At the heart of each Antegods team is the titan, a gigantic flying battle fortress. It plays a large strategic role on the battlefield, but also gets involved in direct combat. You can dock in the titan’s pilot seat and position it anywhere in the level, which helps it fulfill its multifaceted role. First and foremost the titan provides the victory and defeat condition for a match. If your titan is destroyed you lose the game, and vice versa if you destroy the opposing titan you win the game. So don’t take unnecessary risks when positioning your titan, you’ll be harshly punished. Secondly it’s the spawn point for your team, meaning that you appear next to your titan after dying. Use this strategically to gain control over important areas in the map, as you’re always putting map pressure at the position of your titan. Finally the titan is a weapon, once you’ve unlocked its power. The pilot unleashes a large shockwave, which destroys any nearby opponents. Meanwhile the gunner fires the titanic cannon to rain down destruction from a distance. The titan starts off without any offensive power. Throughout the game you gather energy from the level and deliver it to the titan-charging point at the center of the map. Did you power your titan half-way? Then whoever pilots the titan can unleash the shockwave. Once you fully powered your titan the gunner seat opens up: another mech can dock into the titan and control its cannon. Powering up of the titan is the only permanent progression in the game and builds up towards a climactic titan battle. During that battle it’s do or die: whichever team takes too much damage will end up losing their titan and thus the match! We’ve run into a couple of issues with the current design for the titan. Battles between titles aren’t interesting for more experienced players, because essentially you’re firing at a giant hitbox to bring down a large amount of hitpoints. The tactics you can use are to shoot the pilot and gunner out of their seats, and positioning your titan relative to the other titan. These tactics turn stale when playing the game more often. Next, the titan cannon feels unfair to play against, as you get shot from outside of your screen without warning and it’s very difficult to avoid it. Finally it’s very difficult to utilize the titan in an interesting way when you haven’t powered up the cannon. During most of the game you position the titan in a safe position near friendly turrets, at most using the shockwave when enemies try to kill it. Most other tactics are punished with permanent damage on your titan. The titan will have a rounder shape, shorter and wider than the initial titan. This should make it easier to move horizontally and squeeze between objectives. 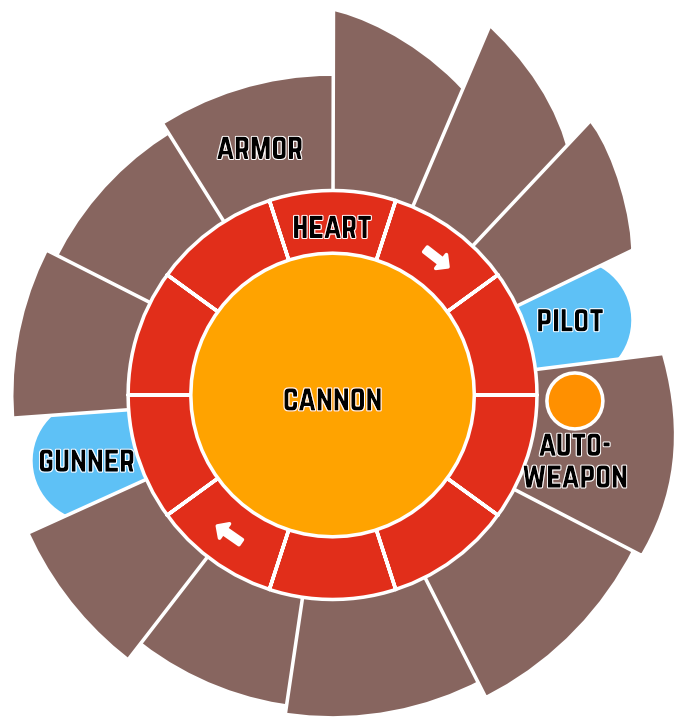 We’ll also change the placement of pilot to the front and gunner to the back, instead of on the top and bottom. This should open up more positioning options to the teams, so you’re not always punished for moving your titan to the other side of the enemy’s titan. The titan will partly consist of destructible material. The outer shell of the titan is built out of tough destructible armor pieces, which regrow after ~15 seconds. Underneath the armor pieces of the titan is a ring-shaped ‘heart’. The heart of the titan represents its health and is made of destructible material similar to the armor pieces. The heart does not regrow during the game: once a part of it is destroyed it’s permanently destroyed. When the entire heart of the titan is destroyed the entire titan is killed. 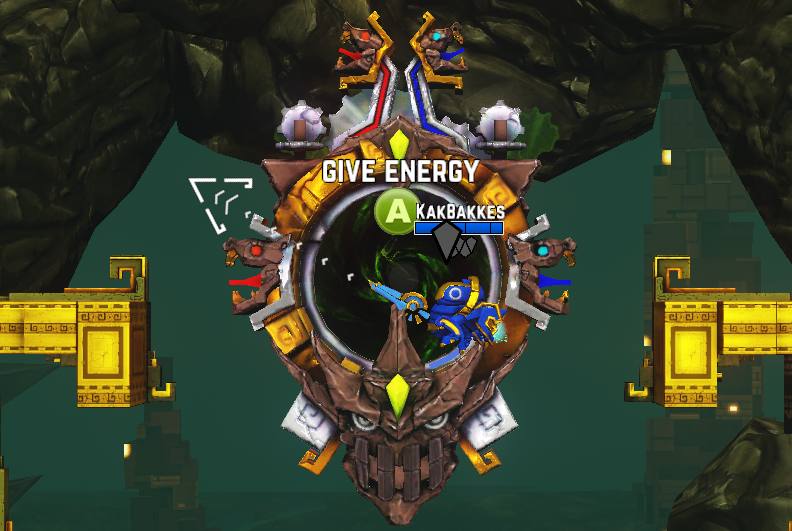 The heart ring slowly rotates (clockwise for the Red team, counterclockwise for the Blue team) to prevent players from camping next to the level edges with their titan. These two destruction changes should force players to focus their shots on a specific part of the titan in order to damage it. As the titan loses parts of its heart it becomes more difficult to destroy the last remaining pieces, which makes it possible for a team that has fallen behind to come back and builds up to an climactic final battle. The titan will get a weapon that’s active from the start of a match. This weapon automatically fires at enemies that come nearby. It’ll provide the titan with much-needed self-defense to deter cheesy single-Totem attacks and open up earlier offensive titan tactics. We need to experiment with the specifics of the weapon, but the first version will rapidly fire long-range projectiles with relatively low damage per shot. The Automated Weapon will target enemy mechs and turrets, but not the enemy region control point and titan. When the titan is fully charged, you can deliver additional energy to overcharge it. An overcharged titan’s armor and heart can’t be destroyed. Every time the titan’s armor and heart are hit, it instead depletes a portion of the overcharged energy until that pool is empty. This hopefully opens up the opportunity for teams to make a comeback when their titan is damaged, or gain the upper hand in a stalemate. A new version of the titan cannon will be tried out, that should be more fun to play with and against. Charging the weapon shortly will fire a single rocket, effective versus a single opponent. Charging the cannon longer launches multiple rockets so you can target multiple opponents in a wider area. A new version of the titan shockwave will also be tried out, which will offer greater control and power to the pilot. Instead of the current circular shockwave, the shockwave will cover a 120 degree arc. The pilot will be able to aim and fire the shockwave in a direction. It’ll expand outwards in that direction similar to how the current shockwave moves outwards. Compared to the current shockwave it’ll have a larger range. The pilot will be able to use the shockwave, without destroying the cover of nearby terrain. The sum of all these changes should lead to a titan that’s even more strategic in its use, but especially more interesting to attack and defend. You’ll have to launch a well-organized attack on the titan to deal considerable damage, heightening the importance of teamwork further. We’re very excited about this rework and would love to hear you comments and ideas!